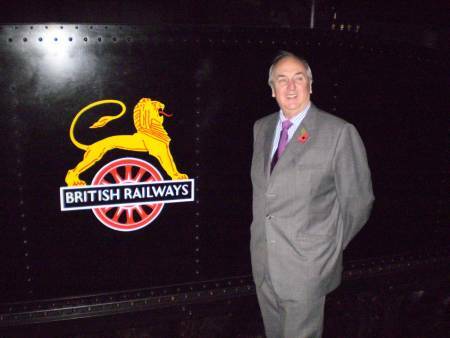 Not many people get the chance to save a piece of rusting old railway machinery which bears their own name, but thatâ€™s just what Bernard Wickham, 68, who lives in Bromley, Kent has achieved at the South Devon Railway. But instead of having a gleaming steam engine or a plush new coach named after him, Bernard Wickham has just helped fund a Â£5,000 restoration and rebuild of an old Wickham trolley which bears his name: the single cylinder 40HP engine was built by Bernard Moteurs in France and the trolley was built by D. Wickham & Co. Ltd. of Ware in Hertfordshire. Since its rescue by the SDR, it has been affectionately known as the Bernard Wickham. The machine was purchased from Wickhams by some London Group members in 1989. 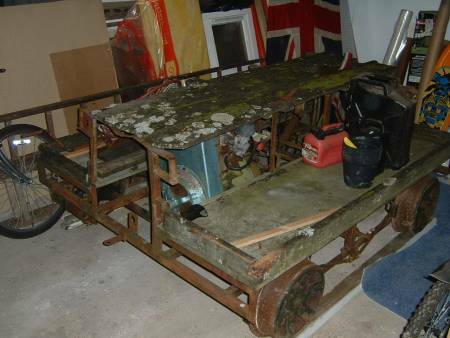 After the trolley spent a decade quietly rusting in the Kent garden belonging to Gavin Bishopâ€™s parents, awaiting restoration, Peter Treglown, former London Group Secretary and instigator of its purchase and now South Devon Railway marketing director offered it a home in his garage to save it from further deterioration. â€œThe London Group bought it but it rather got forgotten. It had sat in the garden near Maidstone for a long time and even had a tree growing through it, so about five years ago I thought it must at least be put under cover,â€� said Peter. 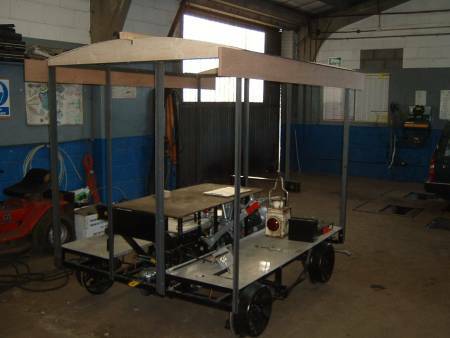 â€œAs a result, it arrived in my garage and evicted my car! When Bernard found its picture on our website, he contacted me and asked to come and see it with a view to funding its complete restoration. 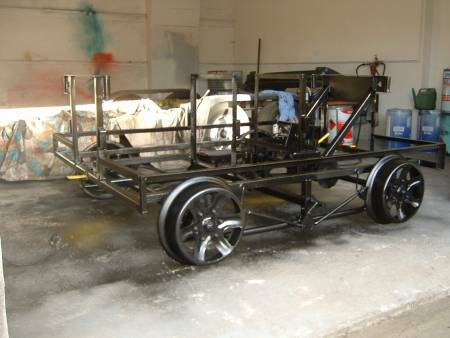 I was absolutely delighted to take up his offer!â€� Since then, the â€˜Bernard Wickhamâ€™ trolley has been receiving the most thorough rebuild and restoration, including the design and construction of a new body, under the care of Trevor Mallett, owner of Salhouse Service Station in Norfolk, Peter Treglownâ€™s local motor engineers. Little had been known of the vehicleâ€™s history until a chance meeting earlier this year between Bernard Wickham and Mrs Shirley Finn, a former PA to the managing director of D. Wickham & Sons, in the Ware Museum which Mr Wickham was visiting. Hearing the story of the â€˜Bernard Wickhamâ€™, she contacted Keith Gunner who has put together a very comprehensive record of all of Wickhamâ€™s railcars. Mr Gunner said: â€œMy understanding is that the car was built as a prototype and demonstrator Type No.4, possibly in connection with a large order that was placed for Bernard-engined Type 4s for Indonesia, delivered in 1977. It was noted by us under construction on 4 June 1976, but it was not then allocated a works number. We never heard of it leaving the works. It appears to have lain outside forgotten until about July 1989 when it and two trailers were sold to the South Devon Railway. 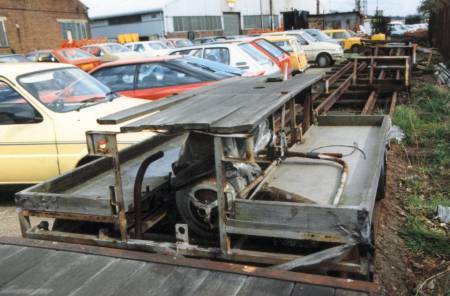 It was only then that they were allocated works numbers, the Bernard car as 11717, and the trailers, classed Type No.17, as 11718 and 11719.â€� Of the trailers, 11718 is still in use on the railway (and deserves a new works plate!) but 11719 was damaged and went for scrap. 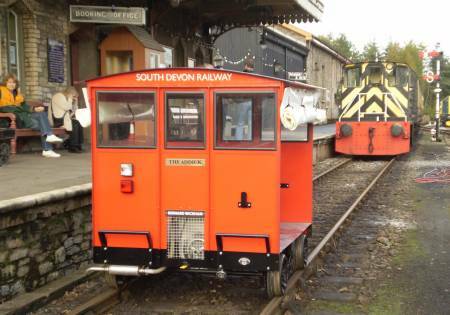 As far as can be ascertained, the trolley has never worked in service, so its first trip up the line as far as Staverton on Sunday, 12 November was probably the furthest it had ever travelled, despite the fact the trolley is 30 years old. 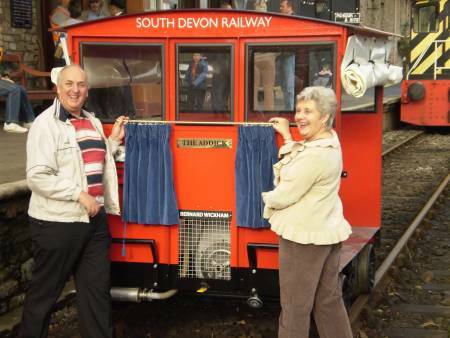 The Bernard Wickham trolley was formally named â€˜The Addickâ€™ by the real Bernard Wickham at a special reception on Sunday 12 November. An â€˜Addickâ€™ is a supporter of Charlton Athletic FC, where Mr Wickham is chairman of the Former Playersâ€™ Association. Very appropriately, it is finished in Charlton FCâ€™s gleaming red and white colours. Peter Treglown added: â€œThis is a fascinating bit of railway history and, probably uniquely, is the only bit of â€˜newâ€™ railway equipment weâ€™ve ever had on the line. My plea to anyone who uses it is, please, look after it and treat with the respect it richly deserves. 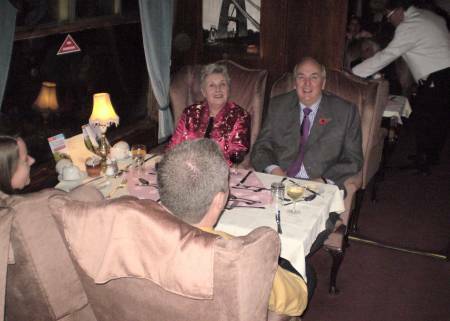 I cannot thank the real Bernard Wickham enough for his remarkable generosity.â€� To celebrate the entering of the Bernard Wickham into service, Bernard Wickham had a special dining train for friends, including Karl Immermann who had flown from Los Angeles for the event, family and invited guests from the SDR, including representatives of the owning groups of the lineâ€™s other Wickhams, namely the London Group, Glendower Group and Worcester Locomotive Society. Richard Axford, custodian of the London Groupâ€™s original Wickham, which has been out of service for ten years or so, was heard making plans to get that machine transferred from its garage at Staverton to his workshop in Maidenhead for a similar rebuild!